This site includes many functions that allow you to work with us from your office or home. Of course, it's sometimes still necessary (or preferred) to conduct business in-person. Sign-Age has many examples of our work and exhibit systems on display in our showroom and we would love to meet you in person. That being said, come and see us or make contact with one of our visual communications representatives if you would prefer an appointment. 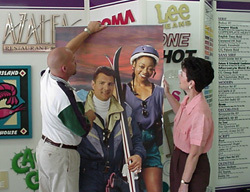 The Sign-Age showroom is located at 16036 US 19 North, Clearwater, Florida. We are in the Tri-City Plaza at the northwest corner of US 19 North and Hwy 686 (also known as Roosevelt Blvd. and East Bay Dr.) Please call us if you need specific directions to our showroom.